Caldwell Family: Rain, rain, come again! 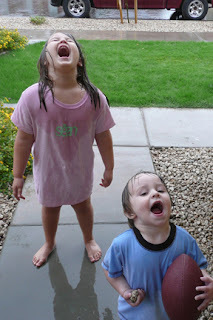 I just found this picture of the kids in the rain. It had been raining all night and when the kids woke up they just wanted to go outside and play in the rain! We all ran around out in the rain for a minute and then the kids jumped into a warm bath. They still talk about "tasting the rain."